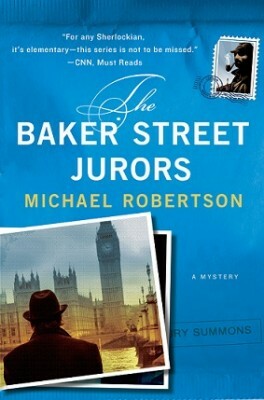 This week we have a review of a perfect book for Sherlock Holmes fans, Baker Street Wedding by Michael Robertson. We also have a fun article by Michael about 221 B Baker Street. 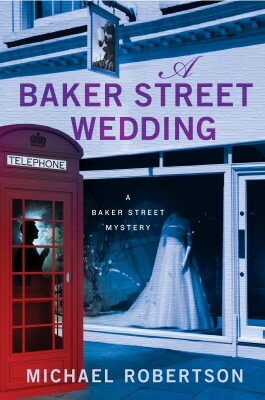 Details at the end of this post on how to enter to win a copy of Baker Street Wedding. There is also a link to purchase it Amazon, and an indie bookstore where a portion of the sale goes to help support KRL. Reggie’s finding out a lot about his new bride, even before the ink is dry on the license. Who knew she had a plane and knew how to fly it? The wedding might have gone smoothly except for a slip of the tongue by Lola, Reggie’s law clerk. It was unfortunate but understandable after four glasses of wine. Now the couple has run off to parts unknown and Lola is worried. However, a stranger drops by the office and offers his help. With no one else to depend on, Lola accepts and the game is afoot! This is book six in the series. Reggie’s law firm is located at 221 Baker Street and receives mail addressed to Sherlock Holmes. It’s Reggie’s responsibility to handle the requests therein. It’s when Reggie’s job and Laura’s past overlap that brings about life-threatening problems for them both. There are references to Holmes throughout the book, but readers don’t have to be overly familiar with the Holmes stories to enjoy this tale. Only one threw me (a name) and a quick Google search soon filled me in. Laura and Reggie are a delightful pair. If they can get into this much trouble on their honeymoon, I look forward to reading about their marriage. 221B Baker Street. We all know who created that address, and we all know who lived there. And we all know—don’t we?—that it was fictional. But until recently, there actually was a structure that encompassed those numbers on Baker Street, a building that created a unique intersection between the real world and the fictional one. 221B Baker Street did not exist when Sir Arthur Conan Doyle first created an occupant for it. But in 1932, the Abbey Road Building Society, which later merged with another large bank to become Abbey National, happened to put up its headquarters right where 221B would have been, if only it were real. From that point on, whenever someone wrote a letter to Sherlock Holmes at 221B Baker Street, as many have, the Royal Mail faithfully delivered that post to Abbey House on Baker Street. People were writing letters to Sherlock Holmes long before Abbey House was built of course, as early as 1890. You might think that by the 1930s, the letter writers would have begun to suspect that if the detective did exist, he would be getting on a bit in years, and in subsequent decades, it should have been completely clear that whatever corporeal existence he might have once possessed was long since gone. But not so. The letters to Sherlock Holmes continued to arrive at Abbey House until just a few years ago. No doubt many people have written to 221B Baker Street just for the curiosity and fun of getting a reply, especially after it became widely known that Abbey National, conscious of its role as custodian of the address, made sure that every letter writer received a response on behalf of Mr. Holmes. But even among the modern letters, some correspondents have continued to believe that Sherlock Holmes must be real and that, with luck, he might be willing to assist them with problems in the real world. However, there have been changes recently on Baker Street. Abbey National became part of a larger corporate group, Santander, and relocated its headquarters. Abbey House, the building that received the letters for so many years, was demolished in 2005, and letters to Sherlock Holmes are now delivered a bit further up the street to the Sherlock Holmes Museum, which now officially claims the address 221B by agreement with the Westminster City Council. But for me, a fiction writer and a Sherlock Holmes fan since childhood, the phenomenon of the letters and what it could have meant for a modern business to have that address and receive them is too interesting to pass up. What sort of people would write such letters? What if you, quite unintentionally, acquired the responsibility of responding to them? And what would you do if you received such a letter and it stated a problem of such urgency that you could not simply respond by stating that Sherlock Holmes has retired and is in Sussex keeping bees? With those questions in mind, I write a series of novels that assume another corporate giant took over that building on Baker Street, that it leased an entire floor to a barrister—one Reggie Heath—with a provision in very fine print that he deal with the letters from now on; and that Reggie Heath, having more important problems of his own (including possibly losing actress Laura Rankin, the love of his life), tries to shuffle that responsibility over to his younger brother Nigel—or to anyone else willing to accept it. But like it or not, Reggie has to find a way to deal with the letters that keep arriving at 221B Baker Street; letters written to a detective who is fictional, but who so dominates the public consciousness of what a true detective should be, that more than one hundred years on, people still believe him to be real. The Baker Street Letters series is now on book six, and I will acknowledge that it is beginning to show signs of another phenomenon, which experienced Sherlockian authors warned me of when I started out—which is that, no matter what you do in creating your own characters, if you attempt in any way to enter the reality that Sir Arthur Conan Doyle created (or even to just shamelessly exploit it from a distance), sooner or later, Sherlock will take over. We shall see. For what it’s worth, in book five, The Baker Street Jurors, not only does a jury summons arrive addressed to Sherlock Holmes, but a violin-playing busker named Sigerson surfaces from the London Underground to respond to it. And then the man insists on coming back again in A Baker Street Wedding. Will he take over? We shall see. To enter to win a copy of Baker Street Wedding, simply email KRL at krlcontests@gmail[dot]com by replacing the [dot] with a period, and with the subject line “baker street,” or comment on this article. A winner will be chosen February 9, 2019. U.S. residents only. If entering via email please include your mailing address (so if you win we can get the book sent right out to you), and if via comment please include your email address. You can read our privacy statement here if you like. Check out other mystery articles, reviews, book giveaways & mystery short stories in our mystery section. And join our mystery Facebook group to keep up with everything mystery we post, and have a chance at some extra giveaways. Be sure to check out our new mystery podcast too with mystery short stories, and first chapters read by local actors. We will be featuring Baker Street Wedding in a future podcast. Michael Robertson lives in San Clemente, California. He spends his spare time surfing a few hundred yards north of a shuttered nuclear power plant. He is the author of the Baker Street Mystery series, including A Baker Street Wedding. Thanks for this intriguing and captivating novel which I would treasure. The story and setting is unique. Thank you for a chance to win this. Holmes is an old favorite of mine. One of the first “grown-up” series’ I ever read. Thanks for the chance to reconnect! What fun! This is a new-to-me series, and as a longtime fan of Sherlock Holmes, I can’t wait to read these. Thanks for the chance! This is a brand new series to me. It certainly sounds like something I would love. I am a fan of Mr Holmes. Yes please I’d love to win this book for my home library. The two counties where I have library cards do not buy this series. remember a lot about them. I’m entering the contest. The book sounds interesting. The article about the address was very interesting.